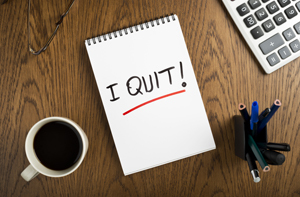 Skylark Blog: Will Quitting Your Job Reduce Child Support or Alimony? Will Quitting Your Job Reduce Child Support or Alimony? It is a common refrain that support payments are usually more than the payor wants to pay and less than the recipient wants to receive. This discrepancy can be extreme when the parties have been used to a particular lifestyle and the payor's income decreases significantly. It is also understandable that a recipient would be skeptical about reducing support if an income decrease for the payor was voluntary, e.g. quitting his or her job. Those were the circumstances in the recent Appeals Court decision: Emery v. Sturtevant. The husband/payor in the Emery case resigned from a high income position for "personal reasons" and after an extensive job search obtained a much lower paying job in the same line of work. He then sought a reduction in his child support and alimony which the trial court dismissed indicating that they were attributing income to him at the job he left. While the Appeals Court acknowledged that "[a]ttribution of income may be appropriate when a judge determines a career change is voluntary", they also noted that there is a second component of that review. The second component is whether the party "thereafter failed to make reasonable efforts to secure comparable employment." Examples given by the court of where this type of attribution might be appropriate were when a party takes an early retirement, or chooses to work in an unrelated field despite the availability of higher paying jobs. The Appeals Court was therefore giving more weight to the availability of comparable employment in the same field than the fact that the husband left the first job voluntarily. According to the Appeals Court, the "facts of this case are distinguishable from the voluntary career change line of cases." Since the husband had obtained a job in comparable employment, despite the much lower salary, the Appeals Court indicated that the lower court was required to consider whether the husband could have obtained a higher income in a similar position: "The reasonable efforts inquiry is critical, and is generally the determining factor in whether to affirm the attribution of income to a party based on his prior earning capacity." The Appeals Court noted that the trial "judge did not make a specific finding regarding the reasonableness of the husband's efforts to secure employment" and they determined from the record that he had made such a reasonable effort. The Appeals Court gave significant weight to the “reasonable efforts” that the husband made to find replacement employment. While “reasonable effort” is certainly subjective, it is clear that the Appeals Court felt strongly that the efforts taken by the husband in this case were reasonable, despite the lower court's lack of finding on this issue (and presumably the lower court’s disagreement that the efforts were reasonably sufficient). The Appeals Court noted in footnote 15 that the trial judge gave weight to the husband's conduct, finding that the resignation was voluntary and the result of an affair. However, the Appeals Court called this an "impermissible factor", directing lower courts to focus on the importance of the attribution factors only. While this is strong direction to the lower court to focus on the reasonable efforts standard in future attribution cases, it seems unlikely that bad conduct will be ignored in these inquiries. However, the Appeals Court has warned that the reasonable efforts to find replacement employment will weigh more heavily than any conduct that led up to the loss of the initial income . "Income may be attributed where a finding has been made that either party is capable of working and is unemployed or underemployed. The Court shall consider all relevant factors including without limitation the education, training, health, past employment history of the party, and the availability of employment at the attributed income level. The Court shall also consider the age, number, needs and care of the children covered by this order. If the Court makes a determination that either party is earning less than he or she could through reasonable effort, the Court should consider potential earning capacity rather than actual earnings in making its order." "In determining the incomes of parties with respect to the issue of alimony, the court may attribute income to a party who is unemployed or underemployed." "At the outset, we note that 'attribution of income in the alimony context is not different in rationale from that in the child support context.' C.D.L. v. M.M.L., 72 Mass. App. Ct. 146, 153 n.5 (2008). Accordingly, the discussion that follows applies to both alimony and child support." While that may be the case, it is apparent that the parties were fighting over more than the husband's voluntary income change. Both the wife and the husband's standard of living were going to be significantly affected by the husband's voluntary job change. Some discussion in the case of a subsequent Contempt ruling suggests that if the attributed income order had stayed in place, the husband wouldn't have the ability to pay the full order anyway. As with many of our posts, we are left wondering whether these parties would have been better served by a mediation process that allowed them both the opportunity to explore these practical realities, rather than the all-or-nothing see-saw of the trial court and appeals court. This was their second trip to the appeals court and we hope they consider trying another process before they end up there a third time.